Richard Buckminster Fuller was a renowned American engineer and architect, best known for developing and introducing the Geodesic Dome, which is the sole largest design for a dome that can be built directly on the ground as a complete building, without any limiting dimensions, for instance, the globally acclaimed and praised United States pavilion for the Expo 67 in Montreal. Besides his architectural innovations, Fuller was also an influential philosopher and poet, applauded for his unconventional take on global perspectives. 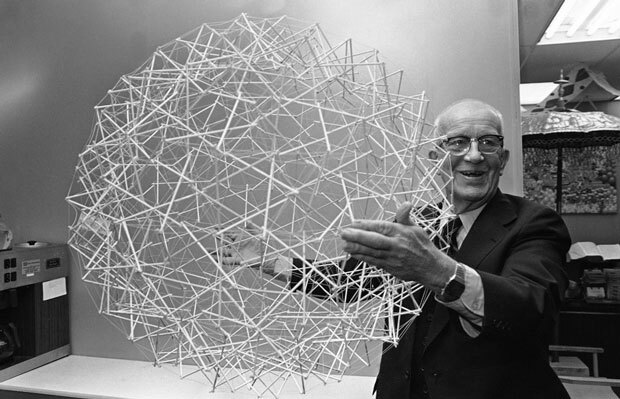 Buckminster Fuller was born on July 12, 1895, in Milton, Massachusetts. He hailed from a family of celebrated New England Nonconformists, his family is noted for producing and rearing some of the most intellectual minds of their times, most famous of whom was Margaret Fuller, his great-aunt, who was a notable teacher, critic and the cofounder of The Dial. Fuller was admitted to the Harvard University, but after being expelled twice, he discontinued his studies and thus never completed his formal degree. He served the US Navy as commander of a crash-boat flotilla during the WWI. Following the war, he collaborated with renowned architect and muralist, James Monroe Hewlett, who was also his father in law, and together they set up a construction company that introduced the use of compressed fiber blocks in construction. Fuller was appointed as the supervisor and overseer of the entire construction process. In 1927, the company got embroiled in severe financial difficulties and Fuller was forced to give up his share as it was meager compared to the other stockholders. This left Fuller financially desolate and jobless and this is when he decided to dedicate his life to a voluntary and non-profit research for designs aimed at increasing the social benefits of the global energy resources and emerging industrial complexes. In 1927, Fuller developed and designed a mechanically-assembled, air-deliverable house that became widely famous as the “Dymaxion House”. In 1928, he designed the first prototype for his three-wheeled omnidirectional transport vehicle, the “Dymaxion car”, which was manufactured in 1933, exhibited incredible mechanical prowess, such that it could accelerate to the lightning speed of 120 miles per hour, carry 12 passengers, and consume only 28 miles per gallon gasoline. In 1943, Fuller was commissioned by affluent industrialist Henry Kaiser to develop a new and revised version of the Dymaxion car, Fuller provided him a design of a car that was powered by three separate air-cooled engines, each engine attached to its own corresponding wheel through a variable fluid drive. This design was never produced commercially. Fuller is accredited for developing the remarkable revolutionary vectorial system of geometry, the “Energetic-Synergetic geometry”, which states that the tetrahedron is the basic unit, and it must be combined with octahedrons in order to form the most economic space-filling buildings. A demonstration of this system is exhibited in Fuller’s geodesic dome, famous examples include the tropical exhibit area of the Missouri Botanical Garden, St. Louis, and the Union Tank Car Company’s dome, Baton Rouge, La, among others. Fuller is also accredited for the development of a system of cartography which is exhibited in his designs for the die-stamped prefabricated bathrooms; tetrahedronal floating cities; underwater geodesic-domed farms; and expendable paper domes. In 1959, Fuller was appointed as a Research Professor at the Southern Illinois University, he served this post until 1968, when he was named University Professor. In 1972, he was appointed as a distinguished professor, and only 3 years later, he received the title of University Professor Emeritus. He has been noted for making several influential and widely acclaimed literary contributions, which include “Nine Chains to the Moon”, “No more Second-hand God”, “Utopia or Oblivion”, “Operating Manual for Spaceship Earth”, “Earth, Inc.” and “Critical Path” among others. He has been the proud recipient of the 1968 Gold Medal Award by the National Institute of Arts and Letters, and also, Queen Elizabeth II bestowed upon the Royal Gold Medal for Architecture.